Atradius picks the top most promising markets for business opportunities in 2017 due to previous strong performances and expected improvement in 2017. 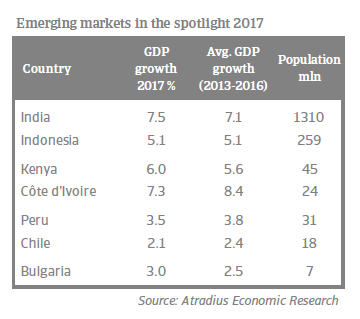 Higher yields, reduced concern surrounding a hard landing of China’s GDP growth, and a stabilisation of commodity prices contribute to a more robust outlook for emerging market economies (EMEs) in 2017. But uncertainty is increasing with challenges stemming from the strong US dollar and prospects for higher interest rates in advanced markets. That said, some markets are enjoying robust, domestically-driven growth in 2017 and are less vulnerable to external volatility, providing potential opportunities for business. Why are these markets so promising? Domestically-driven growth – The outlook for global GDP and international trade growth remains muted for 2017 and developments in the US could cause some financial market volatility. Therefore, all selected EMEs have GDP growth based on private consumption and fixed investment as opposed to exports, especially of commodities. Favourable demographics – These markets generally have young and growing populations, marked by an expanding middle class. This boosts consumption and also increases demand for investment as well as imports. Supportive policies – Policymaking in these EMEs is largely improving and these markets generally enjoy stable political and institutional conditions. Indonesia, Peru, India and Côte d’Ivoire particularly are undertaking business-friendly reforms. Opportunities in the agriculture and food sector could be found in Bulgaria, Kenya and Peru. Rising demand and a fragmented food market provide long-term opportunities for foreign food exporters in Bulgaria. Rising consumer confidence and incomes are boosting demand for imported food and beverages in Kenya and Peru. Total imports of chemicals for India have grown to USD 19 billion in fiscal year (FY) 2015, from USD 10 billion in FY 2013. The growth outlook remains strong as industrial activities will grow and need for innovation increases. Higher industry and household demand are also increasing chemicals demand in Bulgaria, where more than 80% are imported. Dependency on raw materials is the main driver for growth in that market. Demand for infrastructure and investment growth are fuelling opportunities for the construction sector. In Indonesia, real fixed investment is forecast to increase above 6% in 2017. As the government expedites large projects in order to improve the infrastructure in Jakarta and many provinces (e.g. toll roads, bridges, airports and harbours), construction materials demand should increase into 2018 and 2019. Government ambitions in India are also supporting infrastructure growth, which is directly correlated with improvements in the economy. Housing, transportation and IT infrastructure are in high demand. Large public works are also expected under the new administration in Peru. The same accounts for Côte d’Ivoire and Kenya, where major upgrades of infrastructure should provide significant opportunities for building materials and capital goods providers in the coming years. Infrastructure investment and construction sector growth also boast opportunities for machines and engineering. In Bulgaria, demand for machines/engineering products is increasing, driven by accelerating EU investments directed at improving the currently weak infrastructure situation. The aforementioned construction surge in Indonesia is also driving demand there. 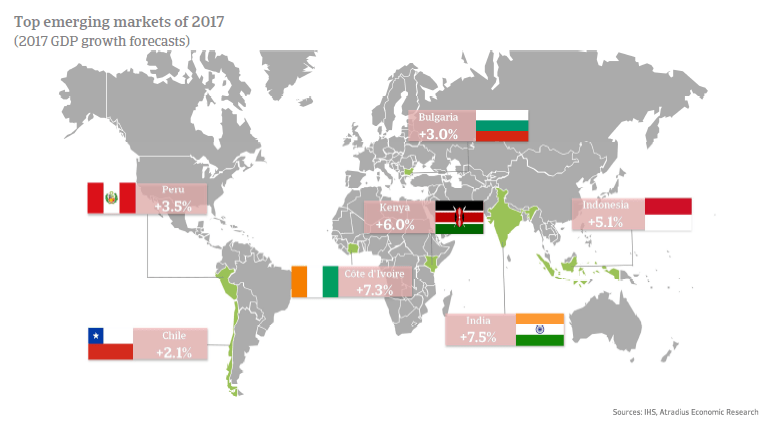 In Côte d’Ivoire, increasing wealth and stable, low inflation is encouraging consumer spending by an emerging middle class, with good growth prospects for retail and fast-moving consumer goods in 2017 and beyond. In Chile and Peru, the retail sector is also forecast to expand further in 2017.
Business opportunities can also be found in India thanks to a very large, consumption-driven economy. Good monsoons will boost rural incomes this year as a large proportion of India’s population is dependent on agriculture, which will increase demand for consumer goods. While demonetisation will hurt demand in the short term, we expect the negative impact to ease in 2017. While strong consumption- and investment-led GDP growth, increasing populations and improving policymaking offer opportunities in these EMEs, it is of course not without risks. Political risk is generally heightened in these markets, particularly those in Sub-Saharan Africa, but they also enjoy relative stability and diversified, resilient economies. The relatively benign outlook for EMEs in 2017 is also threatened now particularly from the effects of developments in the United States. A quicker-than-expected interest rate hike path by the Federal Reserve may expose emerging markets to currency depreciations and capital outflows, increasing borrowing costs and the debt burden if largely denominated in foreign currency. 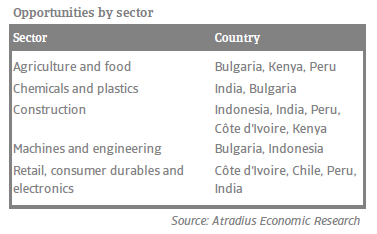 Indonesia in particular is moderately vulnerable, but other selected countries like India, Peru and Bulgaria are well-insulated from external volatility thanks to effective monetary policy, low dependence on volatile capital flows and a relatively low external financing requirement in 2017. Another potential threat to emerging markets is formed by US president-elect Donald Trump’s more protectionist stance on trade, which could weigh on growth in countries that send a large share of their exports to the US (especially in Latin America). Developments in the US related to the election of Donald Trump and its expected effect on the US monetary policy path and international trade introduce significant uncertainty for EMEs in 2017. As a consequence of late payment by B2B customers, 45% of suppliers surveyed in India reported they had to take specific measures to correct cash flow.